Jeri Weatherholt has a college degree from Indiana State University. She works as a medical transcriptionist and lives independently, despite the fact that she has been blind since the age of 10. At first glance, it may seem like there isn’t anything Weatherholt can’t accomplish; and that might actually be the case. 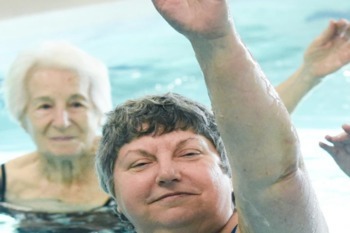 The Indiana U grad has had a lifelong fear of water, but the 61-year-old didn’t let that stand in her way when she decided to learn to swim a year ago. “I want to stress to everybody that no matter what age you are, if you have a disability, get out and try new things and try to overcome whatever fear you might have,” Weatherholt said. If you are living with vision loss, please contact SDCB; we have several programs that can assist you in improving your quality of life and increase your sense of independence.